If you don't see your question, please feel free to contact Blissman & Co. today. We'll be glad to talk to you about your specific needs. Whether you are starting or running a small business or need accounting help for a nonprofit agency, Blissman & Co., is your dedicated, community CPA firm in the Greensburg, Westmoreland County, and Pittsburgh area. How long has Blissman & Co. been serving the community? Is Blissman & Co. a licensed CPA Firm? What clients does Blissman & Co. serve? Does Blissman & Co. provide IRS Representation if I'm audited? 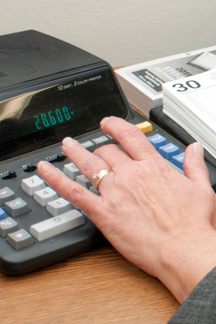 Can I outsource my payroll and accounting to Blissman & Co.? What materials should I bring to my first consultation with Blissman & Co.? What makes Blissman & Co. different? Do you do accounting and tax prep on site? Can Blissman & Co. process my bills? Does Blissman & Co. have experience with nonprofit accounting? Can you get me all the deductions to which I'm entitled? Does Blissman & Co. accept credit cards? Blissman & Co. was founded in 1992 (under the name Grajcar Blissman Co., LLP) and is familiar with the accounting and tax preparation needs of businesses and nonprofits in the Greensburg, Westmoreland County, and Pittsburgh areas. With the retirement of Michael J. Grajcar, Jr., the company continues its community oriented commitment and focus on service excellence under the leadership of Michael Blissman. Blissman & Co. is licensed by the State of Pennsylvania and is registered with the IRS as a tax preparer. Michael Blissman has been a certified QuickBooks Pro advisor since 2001. Our specialties are local small business and nonprofit agencies, but we have wide ranging experience and clients as far away as Hawaii and Washington State. Yes. We'll meet with the IRS auditor for you. Even if you're not currently a Blissman & Co. client, call us. We'll review your records, explain why you're being audited, and become your IRS Representative for the audit. No. Blissman & Co. has built its business by helping local businesses succeed. Contact us today to see if Blissman & Co. is right for your business or nonprofit agency. Yes. But we'll do it in a completely custom, tailor-made fashion that suits your business or nonprofit agency. The help you need when you need it. Visit our Outsourced Accounting page to learn more. Bring your past two years of tax returns, Federal, State, and Local along with your business records. There is no charge for your initial consultation. All tax preparers are not created equal. At Blissman & Co., we do more than put numbers on forms. We review your accounting picture from top to bottom, developing an informed foundation for future tax planning. Blissman & Co. is licensed by the State of Pennsylvania and is registered with the IRS as a tax preparer. Michael Blissman has been a certified QuickBooks Pro advisor since 2001. Yes. Our services are always customized to meet the client's needs; however, we typically make both on-site visits and use remote access technology (GoToMyPC) so that we can perform tasks on your computer without leaving our offices - saving both costs and time for everyone involved. We can even print checks at your site with our remote service. We can work with you in setting a schedule for which bills are paid when, or introduce you to electronic bill paying services where you control the schedule of your payments via an online web interface. We'll find the best solution for your situation. Yes. In fact, accounting and tax prep for nonprofit agencies is one of our specialties at Blissman & Co. Over the years, we've developed a nonprofit clientele and significant experience in the complexities of nonprofit taxes. From churches and clergy to volunteer fire departments and a variety of agencies, Blissman & Co. has the nonprofit experience you need. Every client and every situation is different. Some are conservative and want to stay as far as possible from any possibility of being challenged by the IRS. Others want us to take a more aggressive approach and uncover every possible deduction. By their nature, the tax laws are complex and open to interpretation and clarification by the IRS. At Blissman & Co., we have the experience to advise, educate, and plan in a manner consistent with your needs and goals. Yes. Blissman & Co. accepts Visa, Mastercard, American Express, and Discover for payment of services.